I had a brief chat with the homeowner who gave me a tour of the grounds. He said that Rupp, a financier, built the home for his wife, but that she decided it was too far from Los Angeles and wouldn’t live there. That’s apparently true, because Rupp put the home on the market in 1911. Note that the ad for the home mentions a solar heater. I have no idea what this was and the homeowner didn't know anything about it. Obviously a subject for further research. 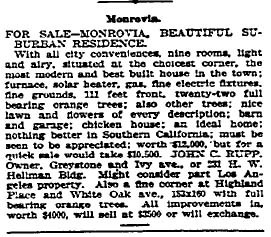 The homeowner also mentioned the Monrovia Old House Preservation Group, which has a website and offers a self-guided tour. I cannot vouch for these folks, but it does sound interesting and the area has some lovely old homes. To get to the Rupp house, take the Foothill Freeway and get off at Santa Anita in Arcadia. Turn north and go to Foothill Boulevard and then turn right (east) and then left on Ivy. The home is at 269 N. Ivy. 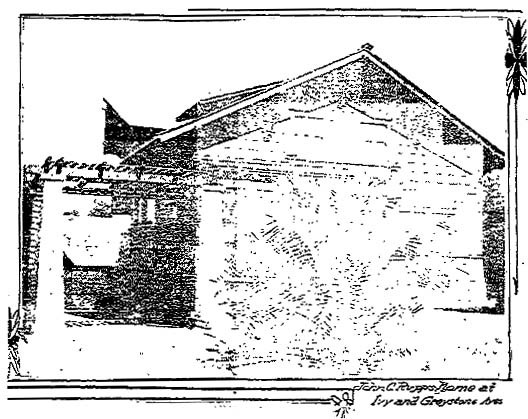 While you’re there, look at the large stone house on the northeast corner, built in 1894. I’ll post some pictures when I get the film developed (we’re old school around here).